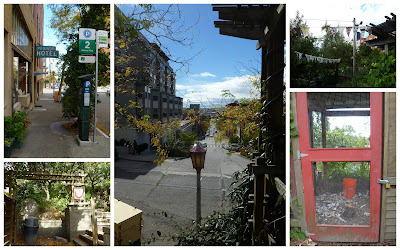 I climbed a steep wooden staircase built on a timbered hillside next to Kobe Terrace Park. A "mackerel sky" portended rain later in the day. A helicopter "whup-whup-whupping" overhead, the wail of a fire engine, the scent of fermented apples lying on the ground and the sound of chickens clucking; not all of these effects are usually expected right in the middle of a major modern city. The theme that pervades the garden is "One Mind, One Spirit"
Today's outing for Seattle Urban Sketchers brought us to a unique community garden among the many that are part of Seattle's urban landscape. Danny Woo International District Community Garden is cultivated by people from China, Japan, Philippines, Vietnam, Korea and other Asian and Pacific Islander immigrants who helped make Seattle the city it is today. Preference is given to those 65 and older and the average age of the gardeners here is 76. Many don't speak English. The purpose of this garden is to enable Chinatown/International District elders a garden in which to work, to feel the earth in their hands, to plant the foods they missed from their native countries, and, most importantly, to provide social connections. This morning I was happy to exchange some smiles and nods with a few of them as they tended their garden plots. I hope they know how much we appreciate their sharing it with us. Watch this short video presentation to learn more about Danny Woo International District Garden. I love your description. The essence of plein air painting. Thank you. It's a rare privilege to be a plein air painter/urban sketcher and to engage in such an enriched life! Your kind words are appreciated.